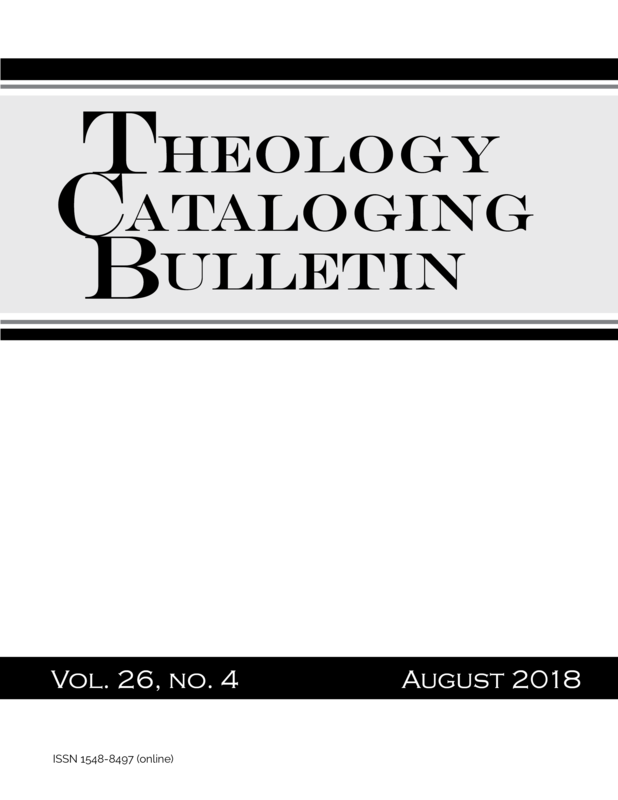 The August 2018 issue of Theology Cataloging Bulletin (TCB), a benefit of membership, is now available. Please click here to access this issue in the members-only section of the ATLA website. Former and current editors of Theology Catalog Bulletin (L to R: Lynn Berg, Tammy L. Johnson, Leslie Engelson, and Alice Runis. This issue’s Testimony is on “Ruminations of a Former Editor: The Theology Cataloging Bulletin as a Reflection of our Profession” by Lynn Berg, Assistant Director of Technical Services (The Styberg Library, Garrett-Evangelical Theological Seminary). This is a must-read issue as Lynn offers a history of TCB, it’s editors, and how the sections came to be. Click here to access the member exclusive publication. This August issue of TCB will be the last for 2018. As mentioned previously, TCB will be on ATLA’s instance of Open Journal Systems (OJS), the same publishing platform used for Theological Librarianship. Beginning in January 2019, TCB will be openly available to all readers through the OJS site under a Creative Commons Attribution-NonCommercial license (CC-BY-NC). Back issues of TCB will eventually be moved from the members-only Community area on the ATLA website to the new OJS site. Further, TCB will continue as a quarterly publication but will shift to a new publication schedule in January 2019. The next volume, volume 27, will start with the January 2019 issue and will be followed by issues in April, August, and October. This shift in publication schedule will allow TCB to more closely align with the releases from the Library of Congress, which are a vital component of TCB’s content. Stay tuned for more information on the new TCB site and how to update your notification preferences in the new My ATLA web portal.